And does your workplace provide spaces that enhance and support how YOU work? There has been a lot of discussion in the past few years about introverts and extroverts within the office setting and of course there has always been a conversation about right brained (visual and spacial thinkers who process information holistically) VS left brained thinkers (those who process information more analytically or sequentially). Needless to say, no single individual is simply one or the other modality, we are much more complex creatures than that. Science has also been adding to this notion of complexity through an increasing number of studies that look at our brain functions and cognitive processes. There are a number of more robust models emerging that look at and categorize different types of work styles – or the individual way we process, organize, and complete tasks. It can be argued that the most successful organizations are the ones that can leverage the diversity of work style and provide spaces that support each of these individual types equally – providing an ecosystem of spaces if you will. Many people have weighed in and named these different productivity work styles but here are the 4 that leading consultant Carson Tate has outlined; Prioritizer, Planner, Arranger and Visualizer. And then let’s take it one step further…what kind of space can we envision that would support each individual work style. OK, let’s take a look! This work style represents a group that is very efficient and analytical in their approach. Consistency is key and this group is very focused on prioratizing to reach time sensitive goals. So, what kind of work space would work for this group? Generally, this group might prefer a logical, professional, and orderly space. Shared benching and open resident spaces would work with some visual privacy – functional, efficient comfortable and able to support their drive to completion. This productivity type is a list maker. Very practical and focused on creating detailed plans and making sequential lists to achieve a deadline. Once on track, this group is frustrated when plans change or derail. This group is energized and looking at the finish line. They need a private space to focus and a bonus would be technology based productivity tools that help them stay on task. 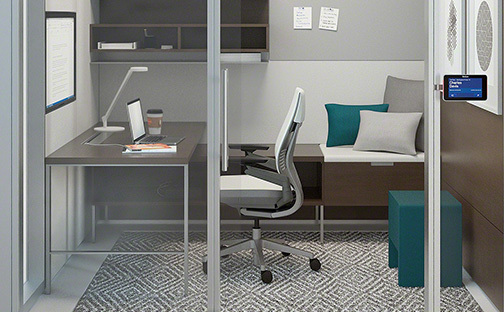 A private space that can be leveraged during active, project focused times would help them stay on track. The hallmark of this productivity type is that they relish conversation and building relationships within the work environment. Highly supportive and expressive, this type prefers teamwork to individual work and enjoys face-time and sharing with colleagues. Lounge settings and meeting spaces that are informal, inviting, comfortable and collaborative would support this work style, accented by whiteboards to seamlessly share information and build mind share. This is the “big picture” thinker. Always looking at a problem with a broader perspective, this productivity work style tends to work intuitively and synthesizes and integrates information into more strategic plans. When thinking about space to support this type of work style, one could look at resident desks that have comfortable lounge seating in close proximity. This setting allows people to bounce ideas off each other and share but then quickly return to a desk and focus on processing information. Do you want to find out your personality work style? Take this assessment! Learning about your work style, learning style, emotional intelligence can really help you dial in the right workplace and organizational fit for you. Not only that, it can help us design better workplaces that support and complement all the inherent diversity within the modern office! Here’s a link to an article with several self assessments. Can a leadership team's space help to influence corporate culture?